Another very similar drug is now being sold as “roofies” in Miami, Minnesota, and Texas. 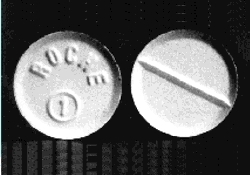 This is clonazepam, marketed in the U.S. as Klonopin and in Mexico as Rivotril. It is sometimes abused to enhance the effects of cocaine and other opiates. Based on emergency room admission information, Boston, San Francisco, Phoenix, and Seattle appear to have the highest use rates of clonazepam. Reports from Detroit indicate liquid GHB is being used in nightclubs for effects similar to those of Rohypnol. It is also common in the club scene in Phoenix, Honolulu, and Texas, where it is known as “liquid ecstasy,” “somatomax,” “scoop,” or “grievous bodily harm.” In Miami, poison control center calls have reflected problems associated with increased GHB use, including loss of consciousness. In New York City, there have been reports of GHB use among those in the fashion industry. In Atlanta, it is commonly used as a synthetic steroid at fitness centers and gyms.